This time we’re showcasing a crime/noir comic book that takes place in the Russian criminal underworld. 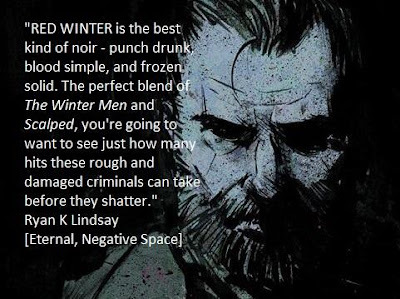 The beginning of a four issue mini-series, Red Winter is made to appeal to fans of comic book scribes like Jason Aaron and Ed Brubaker, as well as prose writers like Dennis Lehane, Michael Connelly and Charlie Huston. 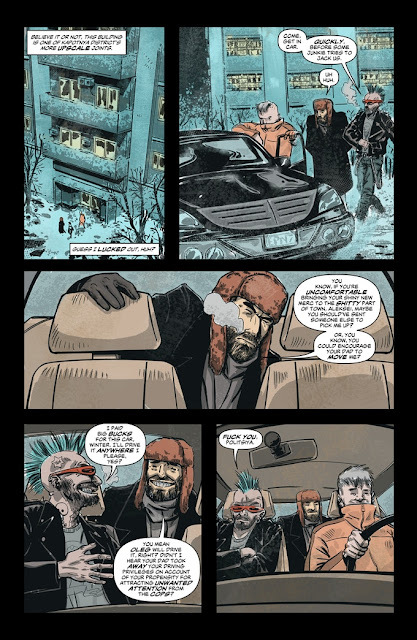 Red Winter begins with Eli Winter, a former NYPD Detective living in Moscow who’s now working for local crime boss Nikolai Dubrovsky as a fixer/bag man/enforcer. He’s looking into the destruction of one of Dubrovsky’s meth labs, which led to the death of several of his men and the loss of his product. But when Eli finds out the person behind the murders was his son Joseph, he needs to protect his son from an entire gang out for revenge. The mini-series is written by Michael Gordon (Transdimensional, Stan Lee’s Lucky Man: The Bracelet Chronicles). Pencils/inks are done by Francisco Munoz (If Anthology 2017), colors by Rolands Kalnins (Tales of the Fractured Mind) and letters by Nikki Sherman (Detached:Into the Compasphere). The cover artist is 2017 Ghost City Comics competition finalist Chris Shehan (Deadbeat, Prometheus). The goal of the project was to reach $949 and it already has more than double its initial goal. The project will end on June 1, 2018 at 5:01 AM EDT. Rewards include digital (about $2.71) and physical (about $7) copies of Red Winter #1 as well as posters (about $13). You can check out the rest of their rewards on their Kickstarter page. Me: You’ve mentioned that fans of Ed Brubaker, Sean Phillips, Jason Aaron and Frank Miller will enjoy this story. What about Red Winter harkens back to stories these creators have written and how would you say your story is unique from all of them? Gordon: I've always loved the crime genre, in comics and in film and in prose. It's probably my favourite genre, and Red Winter is my comic book love letter to all the great crime fiction I've read over the years. Red Winter features bad people making bad decisions, but also has an underlying element of pathos to it that I feel the best crime stories have. 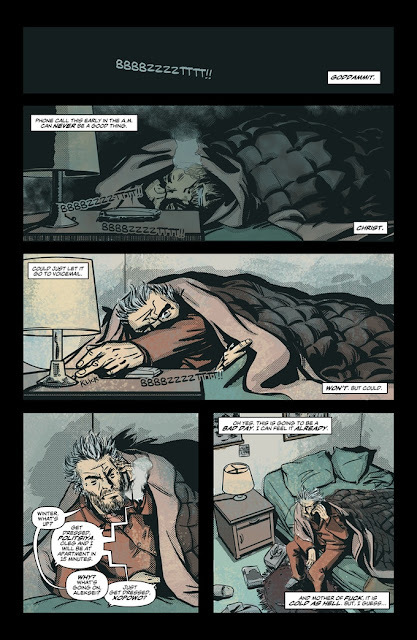 Comics like Criminal and Kill Or Be Killed by Brubaker/Phillips are big touchstones for me, as are Scalped, 100 Bullets, Batman: Year One and Sin City. I love how those stories give you morally complex characters in situations that beg the question “What would you do?” Would you do the right thing and risk getting killed for it? Or would you do the wrong thing and end up six feet under just as quick? I would say Red Winter is unique from those stories because of the character of Eli Winter and the setting of Kapotnya. At its core, it is a crime noir story and deals with some similar tropes (like all crime tales), but Eli and his potentially ill-fated journey towards redemption make it stand out. Me: What can you tell us about Eli and Joseph Winter and how their relationship will affect the story? Gordon: Eli and his son Joseph barely have any relationship to speak of when the story starts. Hell, Joseph's real name is Eli Jr, but he refuses to be called that because he hates his father so much! You could say that they are estranged, but that maybe indicates that they had some sort of close relationship before having a falling out, whereas I've tried to hint in the book that Eli has been such a bad parent/person that Joseph has no relationship with him at all. It's why it's such a surprise when Joseph turns up needing his dad's help; they haven't even spoken in years. It also gives an extra element of sadness to the fact that Eli then decides to protect his son in a misguided attempt at redemption; maybe he thinks one final act of good towards his son can erase years of neglect? Me: Why did you decide to set the story in Moscow versus anywhere else and how will the setting play a role in Red Winter? 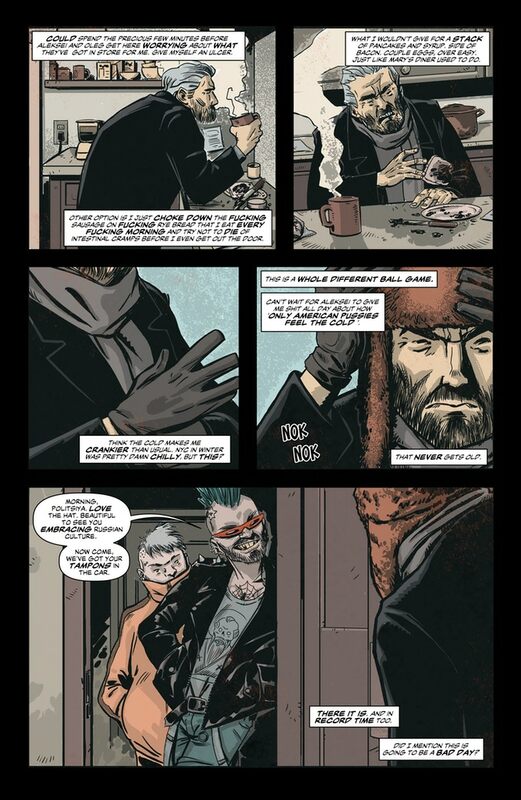 Gordon: The setting of Kapotnya, the most crime-ridden district of Moscow, is integral to the story. I decided to set the story there because, when I was formulating the character of Eli Winter, I knew I wanted to put him somewhere completely alien to him. Somewhere that he would hate with every fiber of his being, but knew he couldn't leave because of the bad decisions he'd made in his life. It means Eli bumps up against everything; he hates the food, he hates how cold it is, he hates that he struggles to speak the language. Put all of that on top of the fact that he hates working for Dubrovsky and it makes for a super interesting (and extremely grumpy) character! I was also aware, to a certain extent, of the organized crime element in Russia as I had watched a few documentaries on the subject and read some books/articles. It then became pretty obvious to me that this disgraced New York cop being forced to live in the most dangerous part of Russia was a story vein I really wanted to tap! Me: Did you have to do any research on the area when writing about it? What was the most interesting thing you learned about it? Gordon: Oh yes! I did quite a bit of research on Kapotnya when I was putting the series together. Sometimes it can be easy to fall down a research rabbit hole, especially when the subject is so interesting, but I found after a few weeks of internet research I had enough that I could pepper throughout the story to add colour to the world Eli operates in. 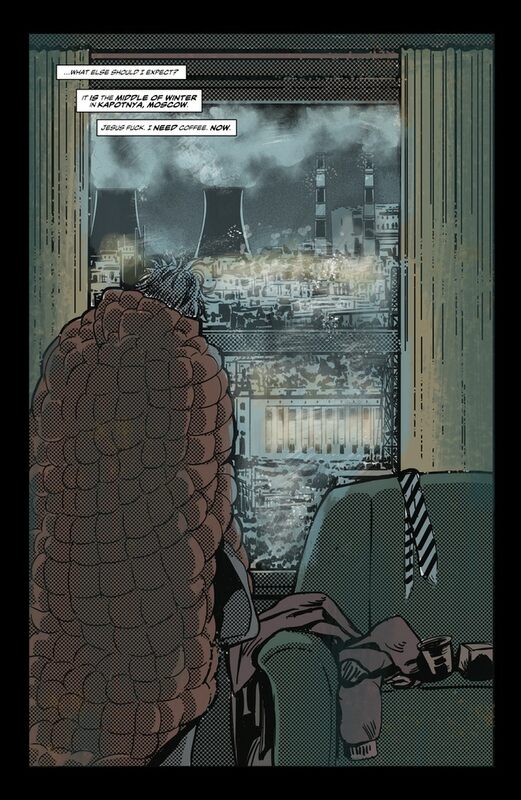 Both of the most interesting things I found out will play big roles in the story as it develops in #2 and beyond, and one of them is mentioned in #1: how a huge colony of homeless people live under the superheated pipes beneath the Moscow Oil Refinery. Eli relates to them, because it's the only place they can survive, but living there is making them sicker every day. I also found out about a drug named “Krokodil,” which is a homemade heroin substitute that was rife in poor areas. It was given the nickname krokodil (or “crocodile”) because its poisonous effects turned the skin of addicts scaly! This drug and its users will come into play as the story develops, for sure. Me: You've already reached your goal on Kickstarter. What do you plan to do with the extra money earned during the campaign? Are there any stretch goals planned? Gordon: Any extra money earned from the campaign will go towards funding #2! Francisco, Rolands and Nikki put so much time and effort into the #1 pages and they'll do that again for future issues, so having funds available to properly remunerate them for their work is very important. Indie comics are hard, so having a pot of cash available always helps! I am planning to announce a Stretch Goal sometime in the middle of the campaign. I'm still sorting out the finer details at the moment! Gordon: The number one reason is because it's a good comic book that will entertain readers. I believe Eli Winter is a very interesting character, filled with remorse, self-loathing and misguided notions of redemption, and he's been a blast to write. The relationships between Eli and his son Joseph, as well as Eli and Dubrovsky, will go to unexpected places that will surprise the reader. The setting of the story is also interesting, and I plan to explore the city of Kapotnya more in future issues; it really is as much of a character in the story as any of the human characters. And the art team have produced a really great issue that I believe could sit on a shelf next to other top quality crime books and not look out of place. I'm very proud of it. Gordon: Don't be afraid to give anything a go. If you want to be a writer, then write. Everything I've done has been building blocks on top of building blocks; nothing comes at once, and it'll probably be a long road. But if you're too afraid to try, or afraid to fail, then you'll never give it a go and find out whether you could make it work or not. I've still got a long way to go until I get where I want to be, but I'm having the time of my life at the moment and it's all because I decided to commit to it and give it a go! Me: Thank you for taking the time to answer my questions! 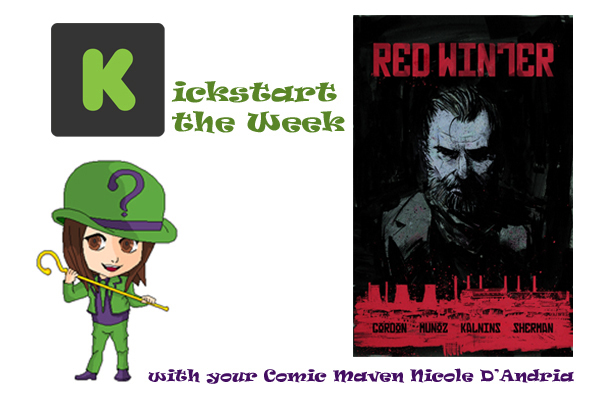 If you’re reading this and want to check out the criminal underworld of Russia, you can check out the Red Winter Kickstarter here.